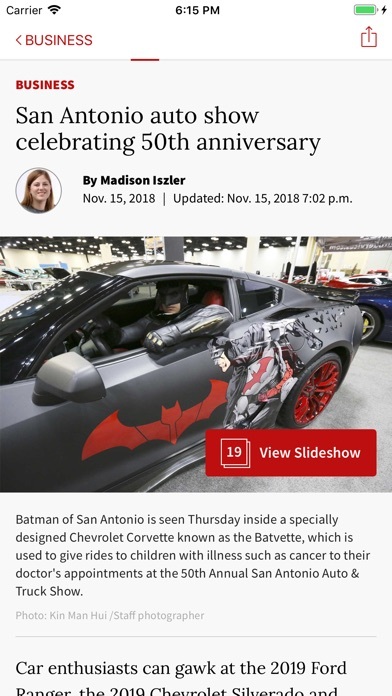 Thanks to SA EXPRESS news app I now know what’s going on in the city and state I live in. I read it everywhere and anytime of the day. And it’s well organized & that’s why love this app. The paper won’t load on my iPad. This started yesterday while I was in the middle of trying to read it. Finally gave up. Today’s paper won’t load either. I have a grayed out front page and a spinning wheel. App freezes up frequently requiring that it be closed and reopened. Search function doesn’t work 100% - can’t find articles I’ve read no matter how I search. Price seems high relative to pricing from other papers. Some days the current edition doesn’t load. Also, the content varies considerably from the print edition. Overall, it’s disappointing. For two months or more, nothing but problems! The iPad app, just says loading. Can’t you fix this problem? This app has a very poor search function. 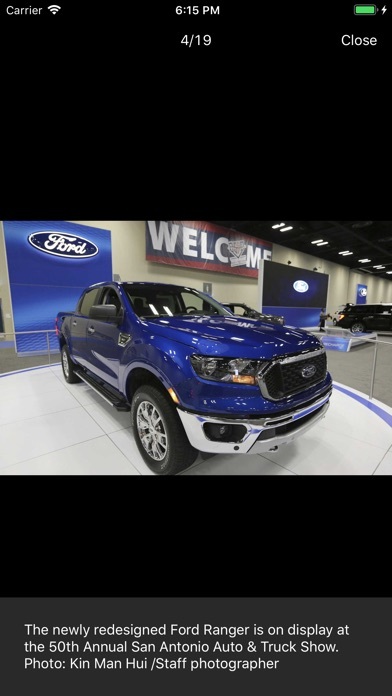 It is difficult to find an article printed in today’s or yesterday’s paper that I want to share on social media or in email (thereby providing free advertising to Express News). Slow loading and locks up occasionally. I subscribe to other papers in Newsstand that work just fine, but this ap often will not load at all. Some stories will not open and tell you that you need Internet access when you already have Internet access. Sometimes you can't get the comics. Using it is very frustrating. In September I gave a very negative review because of constant freezes and crashes. See below. It has since gotten better at least for me. I still find it somewhat difficult to navigate. I also the Wall Street Journal digitally and find it much easier to use. So I pushed it up to 3 stars from only 1. Gave it one star because you cannot give anything lower. It crashes and freezes repeatedly. And, let's face it, it is not a great newspaper to begin with. Thanks for the update and improvements. Have been working like a charm since this last update. Gave it four stars since it’s worked with no problem for few weeks. 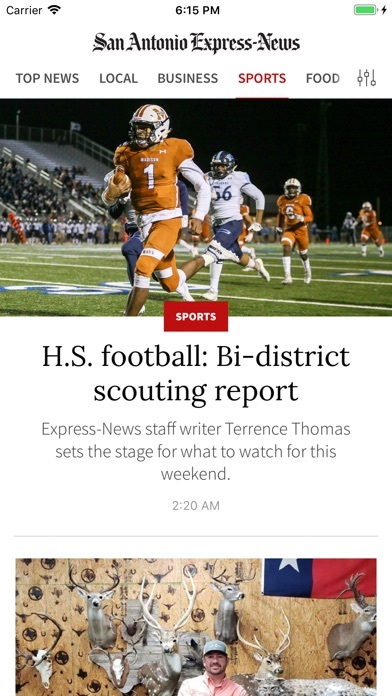 App version of the San Antonio Express and News iPad ed. 2017 version of the e-edition of the San Antonio Express and News is terrible when you get the App. Version. If it would be identical to the email version replica in the landscape version it is much better. The app version is to distractive, freezes up, and hard to navigate. Please leave it like the e-mail replica much better. Bring back the crossword puzzle! Pretty lame to just remove a major feature and then offer no refund for a year long subscription. Sorry I updated. It doesn't work at all now. Shows the paper but not a great experience. Crashes with some regularity. Ads often obscure the bottom row of article text. Contacts to customer support are 100% ignored. They do not even send back an automated response. Crashes regularly. Always return to login page. Too long to download. Takes longer to download than to read. The paper is very easy to page through with the different section icons. And no newsprint on my fingers! Running on an iPad Air 2, you'd expect the news reader to fly. Unfortunately, even the most gifted speed reader would find it difficult to get through an article before the app crashes. I was a big fan of the old app despite it's quirks and eagerly anticipated the much trumped new edition. What a disappointment. This version is impossible to navigate in any reasonable way and is cluttered with zombie content that just won't go away. It's not news if it happened a week ago. This is an embarrassment. I will go back to reading the paper edition. as with others it doesn't recognize logon. endless do-loop of kicking me out. Why would someone put junk like this out? I just used the new version of the app. It loaded quickly and I was able to navigate without using the tutorial. I did check the tutorial after going through the sections. I did not find "Believe it or not" which has been a problem with all versions of the app. The fact that I didn't have to wait for an edition selection to load is a great improvement. At first look, I am impressed. Does not work at all! It doesn't even load anything, the screen goes black and there's a thing spinning but nothing ever loads. I was once able to read the paper via my iPad and enjoy the down time doing so. Now the iPad version doesn't work. The front page updates, ut the remainder of the paper doesn't update at all. When I pull up other sections, they are weeks old. I'm disappointed. Until they fix this app where it works after you pay for it I advise everyone not to subscribe to it. This is typical of the Express News when they have a good idea they can't follow through. I would fire the electronic media staff and hire some high school kids they could make it work. *What happened to the app reset feature? Before, if the app froze, you could go back into settings and use the reset to fix it....it's gone! Please return it! Since the latest update, the first article you tap will start loading and take forever and often just gets stuck. Can't read it if it won't open! * I'd give it zero stars if I could. The old app worked well, and the new one, while I preferred the old version, would at least open before this last update. 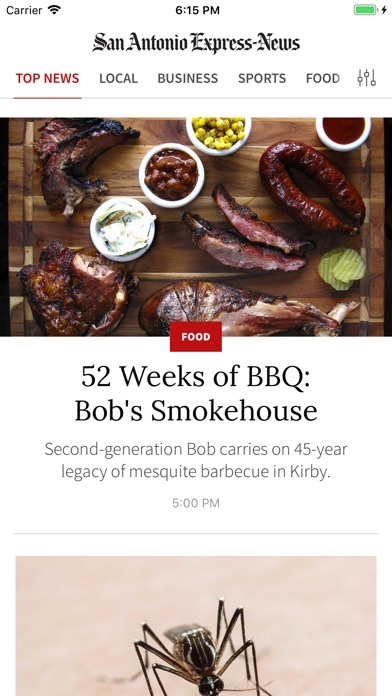 And even though I AM a paid subscriber to the app, it denies access to extra content like recipes. I've emailed and they just don't seem interested in addressing that issue. I don't want a paper delivered...this should be a full-featured alternative or state that you're not getting access. If they can't get it together, I won't renew. As soon as you want to read something it simply wouldn't let you with the "buy suscription" pop-up. Deleted it on the spot. Is it better than it was when it launched? Sure. But it is still very unreliable. The app freezes routinely. Zombie articles continue to exist. iPad app better for reading. This app misses every mark: no puzzles, sudoku, etc. doesn't read like a newspaper. Want my money back. As an online only subscriber this app is terrible and makes the subscription useless. Continuously takes to you the subscription manager where you can successfully login only to be redirected back to the article for one second then redirected back to the subscription manager. The only parts of the app that works are the headline browser pages. Then, to top things off, when you submit a support request from the app the mail is rejected by the mail server because the support email address is unknown. Just terrible. I regret that I bought my subscription. I would give the app negative stars if I could. They should pay me to be the software tester. I'm paying for something that I'm not getting and then finding the problems with their stuff for free as a bonus. I won't renew unless this thing gets a lot better. Terrible. Simply terrible. I can log in on my computer but cannot in the app using the same user id and password. I have deleted this worthless app. If you are looking for the news covered in the paper. Good luck. This app seems to be organized, but try to find a specific article you read in the printed version. Not a chance. There is not a search feature. Just titles of articles from today or maybe last week. One example - I tried to find the article "Waco benefitting from creative energy of 'Fixer Upper' couple (Chip and Joanna Gaines) published 12/05/2015. If it located in the app, I could not find it. How about an archive of previous articles. Nope. Not with this app. If I was able to get back the original app, I would be ecstatic. I have already cancelled by subscription to the app. So long. So I was sure to make a separate app login from the primary account. It said to confirm the account through an email that would be sent. I haven't received it and it's been over 15 hours. I still can't login even though I still pay for a physical paper subscription. So then what's the point of the app if I can't even login. Pointless. The app will not let me log in. Terrible app. Can't sign in to account and links don't help. Olive software mobile is not user friendly either. 1 star because that is lowest score available. Cannot view past editions anymore. NOT GOOD. Worst app I have used. It takes forever to open. I often have to close it and reopen for stories to open. It does not occur with any other newspaper app I have. The only thing worse than this app is Express newspaper delivery team. I had to drop paper delivery after 35 years because it was only being delivered 3 out of every 7 days. SA express needs to get a new team. This app still needs a lot of work. Getting it to load can be exasperating - after several tries I simply grab the print copy of the newspaper. Still get message that I must connect to the Internet when I am connected on some articles. Aggravating to say the least. I have been getting the same picture on the second page for months. Randomly it asks me to login. I can't think of a worse app on my iPad. I would give it 0 stars if possibles. Update: Nothing fixed in months. Update: Can't tell if their new app they have been hyping for weeks works. I tried to use it and it ask me to login. I tried using the password that I know is correct with no luck. Tried link to reset and never received an email with a password rest. No a good preview so far. Update: app crashes before it loads. What a bunch of garbage. Crashing issues are NOT fixed - I have to restart the app after every section just to continue reading. Just not getting any better. How hard is it these days to find good app programmers? This app is an embarrassment. Almost given up on Express-News. Pages freeze and articles will not open. I subscribe to both NYT and Washington Post with easy reading. Lacks any of the functionality of the top line newsreader apps. Pictures are slow to load. It is buggy and freezes a lot. Do not develop a product unless your going to take it serious. Same headlines for days at a time, nothing new in their news. Local info is lacking, I can find national news faster anywhere. Needs a ton of work. Won’t refresh automatically 50% of the time. Locks up and have to exit/restart, often with no success. Already notified help - they said to ensure I was running latest update. I was! They do not inspire confidence. Wish there was an alternative for San Antonio centric news. A new iPad helped, but it remains unreliable. It may be a bit better than in earlier versions but it still needs work. Takes forever to load fresh content, that is when it will. Locks up with a white screen. When you do get content, much of what's in the daily paper is missing. What's the point of reading it? I want to use and like this app. It would be the most convenient way for me to keep up with local news while traveling. But it is the most unstable app I've tried to use. Constant crashes and hang ups make it almost useless. A newspaper app is no longer novel stuff - plenty of companies have a perfectly serviceable product. This one is embarrassingly buggy. First, unless I missed it, there was no advance warning of the change or my existing app no longer working. (In fairness, I was out of the country for 10 days recently.). This one is very difficult to navigate, hard to find what I want, & generally a mess. I hate to see the demise of newspapers, especially investigative reporting, but this hastens it. This App Makes Me Mad! Even though I subscribe to the print version of the paper which is delivered to my home, they want to force me to pay another subscription to use this app. I won't. Load times are horrible. Isn't my internet connection, multiple tries at different locations, same result. Don't even try if you aren't on WiFi, app will crash. I've never reviewed an app before but had to with this one because it is so bad. No STARS for this crappy app. No STARS to this app. It crashed immediately upon opening from iPhone and then when I tried to set up an account it rejected my print subscription number. The email that popped up after it was rejected is not even valid and when I emailed it to get my "valid" print subscription number, the email was returned as invalid! Seriously? If you call the phone number you get idiots too that don't know anything. So much for that. I think I will just unsubscribe now. Such a waste. Half the time my paper is late or not delivered and when I call to report they say it will be delivered but it never is. Same problem for some time. Once I go past the current date I can't go back. Fix it please!!! Such a sorry excuse for a news outlet. Outdated content featured. Every heard of archives? Navigation is sluggish & incomplete. No help from Hearst? Waste of time. This is horrible! Don't fix something if it's not broken. Give me back old version. The content on the app is not even close to the actual newspaper. Never opens up on first try. Extremely slow navigating. Worst app I have ever had. Don't waste your money!! The paper has some excellent local writers and editors, but the app gives you only a select few of their articles, missing some of the best ones. (Or if they're there, they're hard to find!) Please give us all of the editorials and local op-ed columns, all searchable and in one place. Thank you. Not an improvement at all. While the new app initially loaded more quickly, it's sections simply don't match the physical paper. There is no "metro" section, for instance. This app feels like it was made for Hearst and imposed on the EN. Now I find it easier to read the print version than this one. This is the 3rd time I've tried to subscribe. First 2 attempts was a year ago when this site wouldn't take my pymnt. Now it has taken my pymnt and it asks for my zip code and house address number which I just entered and it says they can't find it. Why? Needs work. A LOT of work. 2017 update: Confusing subscription offerings. Subscribing via the App Store does not include access to the website. Customer service advises getting a refund from Apple and then subscribing through their website in order to get access to the iPad app AND the website. Wait, what? Exasperating. 2014: Buggy, unreliable, crashes regularly, often can't connect to servers, very limited content. Better off subscribing to the website. If you love to watch spinning circles instead of reading with your coffee this app is for you. If it ever does load you will be informed by zombie articles sometimes weeks old which never go away. I can't use this app. This app is never dependable. When you open it, you always have to wait; sometimes close it; it just doesn't work the first time ever! The news does not get refreshed. You were constantly having to close the app. Wait 10 to 15 seconds. Reopen the app. And hope and pray that you get today's news. The minutes drag by excruciatingly as I wait for the stories to refresh. I don't even try using this any more. Splash screen says "it's a new day, loading front page", but it reloads whatever the last successful update was ( which is several weeks old in my case). 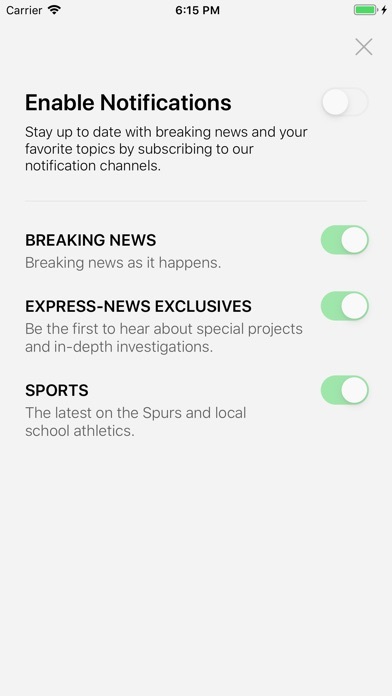 A pathetic excuse for a news app. June 15, 2017 app update:. More of the same. I launch the app, it "updates" to today. Unfortunately I'm staring at probably six week old news. Game 1 of the Spurs-Rockets playoff series is the headline. June 17, 2017: Looks like it may finally be fixed, the app has updated to the current news two days in a row. Yay!! July 9, 2017: Back to its old tricks, says it's updating yet the news is over a week old. I give up, I'm uninstalling it. Slow, when it works at all. As an online-only subscriber to the Express-News, I am asking myself why I bother. This app is useless, I usually have to relaunch it ten or more times just to read one article. It freezes up constantly. It wastes far more of my time than the subscription is worth. And these problems have existed for years and not been fixed or markedly improved. For shame, Hearst. This app is bad! Each update makes it worse. Only subscribed to follow the Spurs which have been dropped.